I’m not sure yet if I like this whole “base bronze before red” method, but I’m going to hold final judgement until I see the end product. So far, I think the balance between red and bronze is working. Remember, the model will be a bit lighter overall once I get the flesh tones in. The unit is coming along faster and more painless than I had anticipated. This is a good thing! Yay! I carved out some time last night to paint, and was surprised how much I got done. I think my productivity was increased by the fact that I wasn’t watching a show, but instead listening to Jim Butcher’s Q & A at a recent book signing – ie, something I didn’t have to watch to understand and fully enjoy. Anyway, I wanted to get some base coats down on my minimum unit of Praetorian Swordsmen, so I got the big brass basecoat done. Brass takes two layers, since it’s coverage is horrible. Because of this, I usually only do the first coat half-heartedly, and thus rush it. Thus, it’s sloppy. So, instead of doing metallics last, I did the brass first. I think it’s the much better way to go, since I got all six models base coated in about an hour. Of course, now I’ll spend an entire night cleaning up all the sloppyness with my Windsor 7 and black, but that’s OK.
Once these were basecoated, I decided to finish up a side project I started earlier in the week. 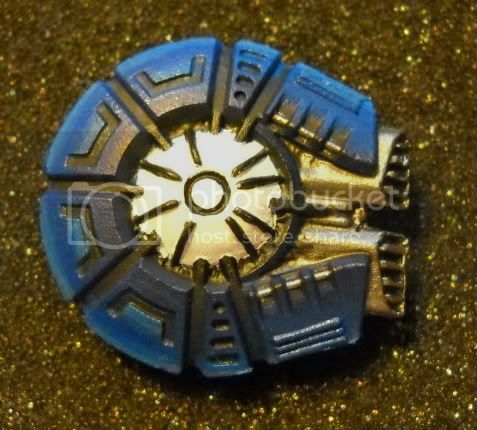 You see, last weekend, the Good Lord Faultimus and I got in a small game of Dystopian Wars. We shot eachother’s boats (or flying boats in his case) and rolled some dice. His tactics were superior to mine, however his dice failed him miserably. Regardless, it was fun, and got me inspired to finish up a small 3-member squad of Trainboat Frigates! Honestly, the hardest part of these boats, is an original stripe pattern for each one. A local store had Spartan Games stuff 60% off, so I picked up a set of Cruisers for the Trainboats, which are medium sized models, and will help me balance out my force (since I didn’t start off with the starter kit). So, in the near future, be on the lookout for SPACETRAINS!! 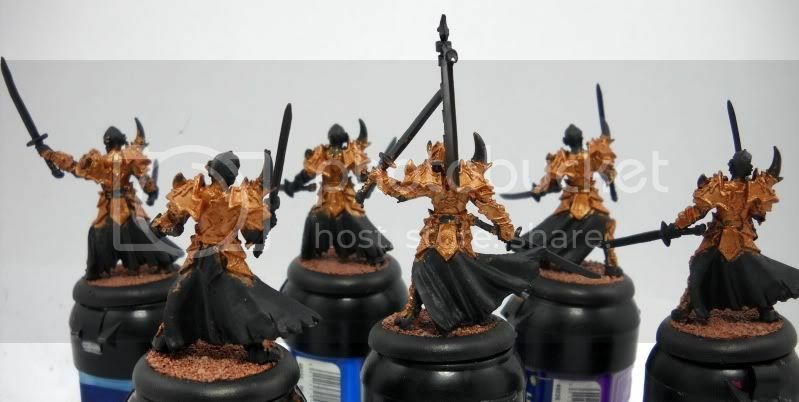 Supplies, Skorne and … Spaceships? I typically allow myself about $20 a week to invest in my models. Three weeks ago it was the Blazing Sun Frigates. The week after that I picked up the Battleship. 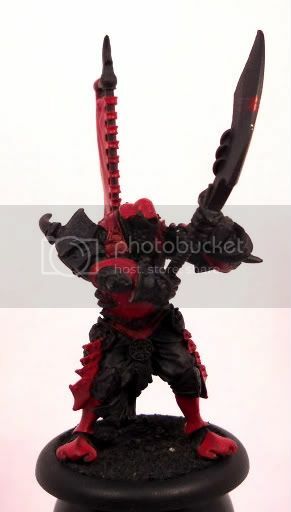 Last week, I picked up Lord Tyrant Xerxis. He’s not put together yet though, sorry. Maybe next time? I bring this up because this week, as much as I want mechanics for my pStryker Theme Force, I bought some hobby supplies instead. 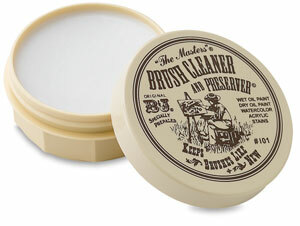 Primarily, I was happy to find Master’s Brush Cleaner . As I understand it, this stuff is amazing. Here’s a Youtube video explaining how to use it. When I get a chance, I’m planning on spending some much needed time with my brushes and this stuff. It will be good. I also grabbed two new brushes. The first was a #2 Chisel Blender that I’m going to use for covering large areas. The other one was a #10/0 Spotter for detail work. Yay for cheap-but-still-(hopefully)-really-nice-and-will-last-a-long-time paint brushes! And, now, if I mess them up, I have the magic soap! So far so good. My other big problem with painting are my old paints. They’re a bit dry and need some attention. So…. I picked up some Liquitex Acrylic Flo-Aid. It helps the pigment separate for even coverage but it also increases water tension. Thus, it makes the paint want to even out into a smooth coat, but if it’s not diluted enough, the paint will pool into drops on the model and not lay flat like it’s supposed to. I’m a bit skeptical, yet optimistic. We’ll see. Enough about random stuff, here’s what you’re really here for. Some pictures of models! I realize it’s fairly unimpressive right now. Sorry. All that’s down is three or so coats of diluted Gore Red . 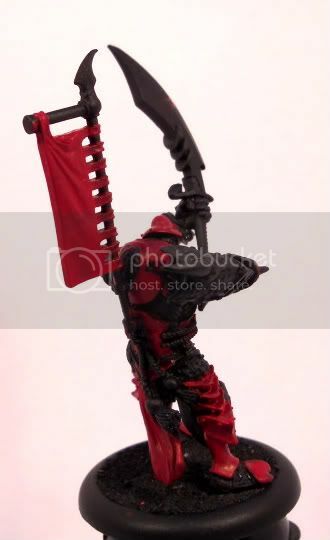 Most of Morghoul’s armor is the lacquered red over gold style, so there’s not much at this stage. 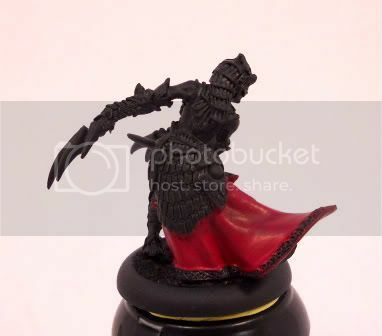 There’s actually a nice tutorial in the Skorne book on the lacquered armor. I’m hoping it turns out for me as well as it did for the studio. He’s looking pretty good. There’s a fair bit of regular old red armor there, so there’s lots to block out. I’m thinking aqua for the accent color… or is that too Everblight? Perhaps some jade green? Thoughts? I’m thinking I’ll be doing my reds via glazing. It involves mixing paint and transparent medium to achieve a see-through-yet-tinted layer of paint. You then layer this on over and over again and the more layers there are, the stronger the original color. 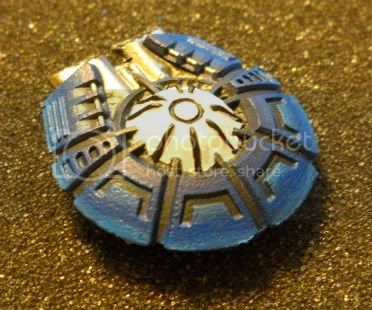 I’ll cover it in more detail, but it worked decently well on my Firestorm Armada Directorate Frigate. Yay spaceships! 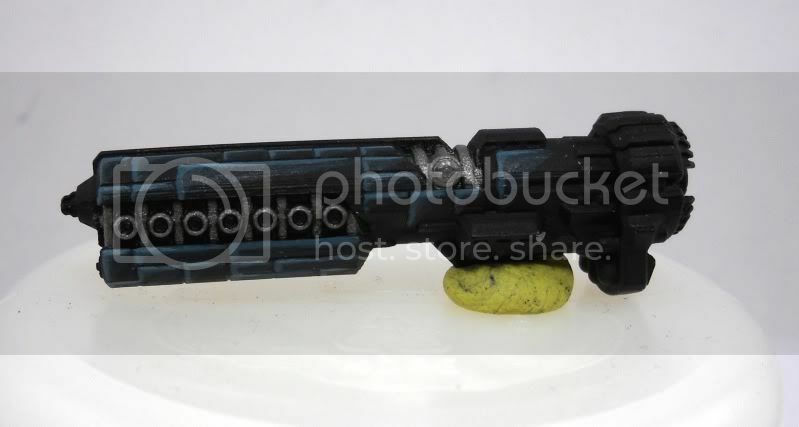 Now, before you scrutinize the little guy, remember… the model’s just a little larger than a quarter. The white dome doesn’t work, so that needs a change. Suggestions? Well, after all that assembly goodness, I took a much needed break and spent the weekend with my wife. We hit a local historical site, drove around and went shopping a bit and then spent Sunday starting to unpack all our stuff in the new condo. Sleeping in has never felt better! 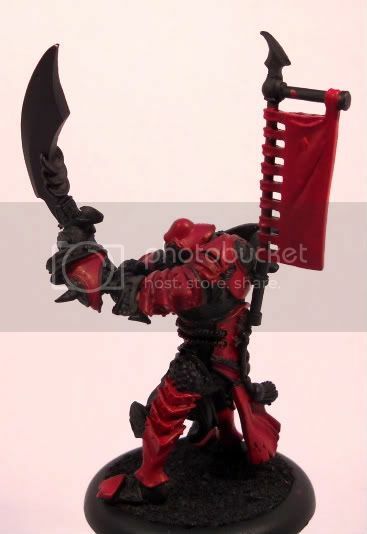 Model wise, I’ve built two more Skorne models: a Cyclops Brute and a Razorwurm. Yes, the one piece Razorwurm has pins. Two of them, holding him to his base. The Brute’s shield feels small on him. I may see about picking up a Karax shield bit and doing something to give the Brute more of a tower shield or something. Right now it just feels small for his tall, lean body. I also stripped some Retribution models. Kaelyssa, Griffon and Gorgon and a Ghost Sniper all went into my Super Clean, and are now in Acetone. The Chimera I have was NIB, so I’ve cleaned up its mold lines (ugh) and started re-working the pose. He’s a super-fast arcnode, so he’ll look it. Base and re-assemble my Striders + UA (so they can be painted soon). Get some Instant Mold for making extra sets of Myrmidon hands (so I don’t have to magnetize the things). Prime my Khador and Skorne models. 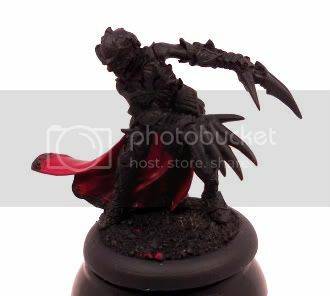 Paint a Forsaken (to polish off a basic 15pt Legion Battle Box army). I snagged a blister of 6 frigates for $10 from the LGS the other day, and they are awesome. I’m very excited to paint up some of these! I’ll likely get a Battleship next. I have the starter fleet pictured here. I’m not going to do green, but was thinking instead of blue. I also like the idea of trimming the flight stand so models are at varying heights. Really plays on the 3D-ness of space battles! Anyway, that’s the plan for now. I’ve got a few things to assemble, and then all the conversion tools go away for a bit and all the painting stuff comes out. Retribution WIP pics tonight or tomorrow!! Get updates instantly via Electronic Mail, I hear it's all the rage! Hey, if you liked something I wrote and are looking to say thanks, consider buying me a beer or a coffee to keep me going! Plarzoid on Grey Knights Kill Team, for Charity! 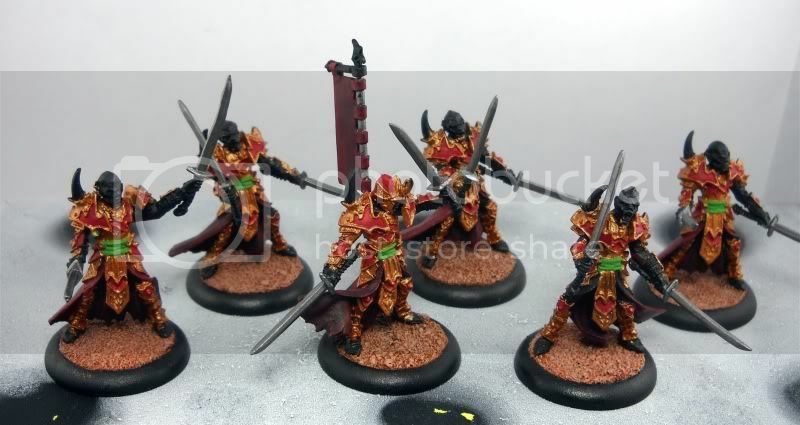 naahz on Grey Knights Kill Team, for Charity!